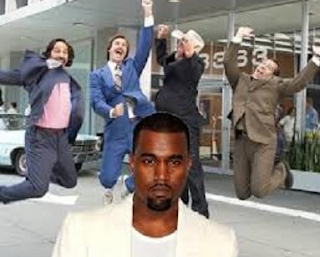 Insider claim Kanye West made a total nuisance of himself on the set of Anchorman 2. Hollywood big gun Will Ferrell, 46, who reprises his role as Ron Burgundy, said: “It was very surreal to have Kanye – who’s such a big fan of comedy – in our movie hanging out for two days. He was playing the new tracks a lot – over and over. Even when you’re trying to film, he’s playing the tracks. Funny-guy Will, who was chatting on The Jonathan Ross Show (catch the full interview on Saturday at 10.05pm on ITV1) also hit out on the Leicester Square red carpet on Wednesday night. Will revealed that thick-skinned Kanye, 36, declined to leave the set after filming his bit. Yeezy, who has said the risks he takes on stage are similar to those faced by soldiers and cops, recently declared to Radio 1’s Zane Lowe that he was “No.1 rock star on the planet”. Poor Kanye.